Bahrain was the central location of the ancient Dilmun civilization. Bahrain's strategic location in the Persian Gulf has brought rule and influence from mostly the Persians, Sumerians, Assyrians, Babylonians, Portuguese, the Arabs, and the British. Whilst the country had closest economic relations with Indians or South Asians for the longest time, much more than the Arabs themselves. Bahrain was the central site of the ancient Dilmun civilization. Dilmun appears first in Sumerian cuneiform clay tablets dated to the end of fourth millennium BC, found in the temple of goddess Inanna, in the city of Uruk. The adjective Dilmun is used to describe a type of axe and one specific official; in addition there are lists of rations of wool issued to people connected with Dilmun. The Bahrain Fort, location of Dilmun artifacts. Dilmun was mentioned in two letters dated to the reign of Burna-Buriash II (c. 1370 BC) recovered from Nippur, during the Kassite dynasty of Babylon. These letters were from a provincial official, Ilī-ippašra, in Dilmun to his friend Enlil-kidinni in Mesopotamia. The names referred to are Akkadian. These letters and other documents, hint at an administrative relationship between Dilmun and Babylon at that time. Following the collapse of the Kassite dynasty, Mesopotamian documents make no mention of Dilmun with the exception of Assyrian inscriptions dated to 1250 BC which proclaimed the Assyrian king to be king of Dilmun and Meluhha. Assyrian inscriptions recorded tribute from Dilmun. 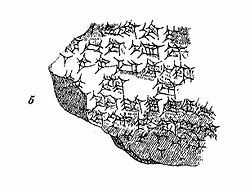 There are other Assyrian inscriptions during the first millennium BC indicating Assyrian sovereignty over Dilmun. Dilmun was also later on controlled by the Kassite dynasty in Mesopotamia. One of the early sites discovered in Bahrain indicate that Sennacherib, king of Assyria (707–681 BC), attacked northeast Persian Gulf and captured Bahrain. The most recent reference to Dilmun came during the Neo-Babylonian dynasty. Neo-Babylonian administrative records, dated 567 BC, stated that Dilmun was controlled by the king of Babylon. The name of Dilmun fell from use after the collapse of Neo-Babylon in 538 BC. There is both literary and archaeological evidence of extensive trade between Ancient Mesopotamia and the Indus Valley civilization (probably correctly identified with the land called Meluhha in Akkadian). Impressions of clay seals from the Indus Valley city of Harappa were evidently used to seal bundles of merchandise, as clay seal impressions with cord or sack marks on the reverse side testify. A number of these Indus Valley seals have turned up at Ur and other Mesopotamian sites. Location of the Dilmun burial mounds in Bahrain. The "Persian Gulf" types of circular, stamped (rather than rolled) seals known from Dilmun, that appear at Lothal in Gujarat, India, and Failaka, as well as in Mesopotamia, are convincing corroboration of the long-distance sea trade. What the commerce consisted of is less known: timber and precious woods, ivory, lapis lazuli, gold, and luxury goods such as carnelian and glazed stone beads, pearls from the Persian Gulf, shell and bone inlays, were among the goods sent to Mesopotamia in exchange for silver, tin, woolen textiles, olive oil and grains. Copper ingots from Oman and bitumen which occurred naturally in Mesopotamia may have been exchanged for cotton textiles and domestic fowl, major products of the Indus region that are not native to Mesopotamia. Instances of all of these trade goods have been found. The importance of this trade is shown by the fact that the weights and measures used at Dilmun were in fact identical to those used by the Indus, and were not those used in Southern Mesopotamia. "the ships of Dilmun, from the foreign land, brought him wood as a tribute". Mesopotamian trade documents, lists of goods, and official inscriptions mentioning Meluhha supplement Harappan seals and archaeological finds. Literary references to Meluhhan trade date from the Akkadian, the Third Dynasty of Ur, and Isin-Larsa Periods (c. 2350–1800 BC), but the trade probably started in the Early Dynastic Period (c. 2600 BC). Some Meluhhan vessels may have sailed directly to Mesopotamian ports, but by the Isin-Larsa Period, Dilmun monopolized the trade. The Bahrain National Museum assesses that its "Golden Age" lasted ca. 2200–1600 BC. Discoveries of ruins under the Persian Gulf maybe of Dilmun. Correspondence between Ilī-ippašra, the governor of Dilmun, and Enlil-kidinni, the governor of Nippur, ca. 1350 BC. In the Mesopotamian epic poem Epic of Gilgamesh, Gilgamesh had to pass through Mount Mashu to reach Dilmun, Mount Mashu is usually identified with the whole of the parallel Lebanon and Anti-Lebanon ranges, with the narrow gap between these mountains constituting the tunnel. Dilmun, sometimes described as "the place where the sun rises" and "the Land of the Living", is the scene of some versions of the Sumerian creation myth, and the place where the deified Sumerian hero of the flood, Utnapishtim (Ziusudra), was taken by the gods to live forever. Thorkild Jacobsen's translation of the Eridu Genesis calls it "Mount Dilmun" which he locates as a "faraway, half-mythical place". whereby water will flow to quench the thirst of all beings and bring abundance to all that lives. Ninlil, the Sumerian goddess of air and south wind had her home in Dilmun. It is also featured in the Epic of Gilgamesh. However, in the early epic Enmerkar and the Lord of Aratta, the main events, which center on Enmerkar's construction of the ziggurats in Uruk and Eridu, are described as taking place in a world "before Dilmun had yet been settled". From the 6th century BC to the 3rd century BC Bahrain was a pivotal part of the Persian Empire by the Achaemenids, an Iranian dynasty. From the 3rd century BC to the arrival of Islam in the 7th century AD, Bahrain was controlled by two other Iranian dynasties, the Parthians and the Sassanids. By about 130 BC, the Parthian dynasty brought the Persian Gulf under their control and extended their influence as far as Oman. Because they needed to control the Persian Gulf trade route, the Parthians established garrisons along the southern coast of the Persian Gulf. Asia in 600 CE, showing the Sassanid Empire before the Arab conquest. In the 3rd century AD, the Sassanids succeeded the Parthians and held the area until the arrival of Islam four centuries later. 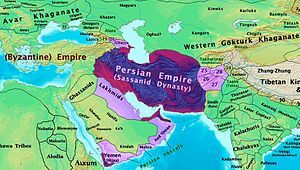 Ardashir, the first ruler of the Iranian Sassanid dynasty marched to Oman and Bahrain and defeated Sanatruq (or Satiran), probably the Parthian governor of Bahrain. He appointed his son Shapur I as governor of Bahrain. Shapur constructed a new city there and named it Batan Ardashir after his father. At this time, Bahrain incorporated the southern Sassanid province covering the Persian Gulf's southern shore plus the archipelago of Bahrain. The southern province of the Sassanids was subdivided into three districts; Haggar (now al-Hafuf province, Saudi Arabia), Batan Ardashir (now al-Qatif province, Saudi Arabia), and Mishmahig (now Bahrain Island). Bahrain was referred to by the ancient Greeks as Tylos, the centre of pearl trading, when the Greek admiral, Nearchus, first visited there. Nearchus was serving under Alexander the Great, who overthrew the ruling tribe of Al Hamar. Nearchus is believed to have been the first of Alexander's commanders to visit Bahrain, and he found a verdant land that was part of a wide trading network. He recorded: "That in the island of Tylos, situated in the Persian Gulf, are large plantations of cotton tree, from which are manufactured clothes called sindones, with very different degrees of value, some being costly, others less expensive. The use of these is not confined to India, but extends to Arabia." The Greek historian, Theophrastus, states that many of the islands were covered in these cotton trees and that Tylos was famous for exporting walking canes engraved with emblems that were customarily carried in Babylon. Ares was also worshiped by the ancient Baharna and the Greek colonists. It is not known whether Bahrain was part of the Seleucid Empire, although the archaeological site at Qalat Al Bahrain has been proposed as a Seleucid base in the Persian Gulf. Alexander had planned to settle the eastern shores of the Persian Gulf with Greek colonists, and although it is not clear that this happened on the scale he envisaged, Tylos was very much part of the Hellenised world: the language of the upper classes was Greek (although Aramaic was in everyday use), while Zeus was worshipped in the form of the Arabian sun-god Shams. Tylos even became the site of Greek athletic contests. Strabo, the Greek historian, geographer and philosopher mentioned that the Phoenicians came from Bahrain where they have similar gods, cemeteries and temples. This theory was accepted by the 19th-century German classicist Arnold Heeren who said that: “In the Greek geographers, for instance, we read of two islands, named Tyrus or Tylos, and Arad, Bahrain, which boasted that they were the mother country of the Phoenicians, and exhibited relics of Phoenician temples.” The people of Tyre, Lebanon in particular have long maintained Persian Gulf origins, and the similarity in the words “Tylos” and “Tyre” has been commented upon. Later classicist theories were proposed prior to modern archaeological excavations which revealed no disruption of Phoenician societies between 3200 B.C. and 1200 B.C. Herodotus's account (written c. 440 BC) refers to the Phoenicians originating from Bahrain. (History, I:1). The name Tylos is thought to be a Hellenisation of the Semitic, Tilmun (from Dilmun). The term Tylos was commonly used for the islands until Ptolemy’s Geographia when the inhabitants are referred to as 'Thilouanoi'. Some place names in Bahrain go back to the Tylos era, for instance, the residential suburb of Arad in Muharraq, is believed to originate from "Arados", the ancient Greek name for Muharraq island. With the waning of Seleucid Greek power, Tylos was incorporated into Characene or Mesenian, the state founded in what today is Kuwait by Hyspaosines in 127BC. A building inscriptions found in Bahrain indicate that Hyspoasines occupied the islands, (and it also mentions his wife, Thalassia). Facsimile of the letter written by Muhammed to the ruler of Bahrain. From the time when Islam emerged in the 7th century until the early 16th century, the name Bahrain referred to the wider historical region of Bahrain stretching from Basrah to the Strait of Hormuz along the Persian Gulf coast. This was Iqlīm al-Baḥrayn, i.e. the Province of Bahrain, and the Arab inhabitants of the province were descendants of the Arab tribe Bani Abd al-Qais. Bahrain embraced Islam in 629 (the seventh year of hijra); the Prophet Mohammed ruled Bahrain through one of his representatives, Al-Ala'a Al-Hadhrami. During the time of Umar I the famous companion of the Prophet, Abu Hurayrah, was the governor of Bahrain. Umar I also appointed Uthman bin Abi Al Aas as governor of the area. Al Khamis Mosque, founded in 692, was one of the earliest mosques built in Bahrain, in the era of Umayyad caliph Umar II. Prior to Islam, Bahrain was a centre of Nestorian Christianity. The expansion of Islam did not affect Bahrain's reliance on trade, and its prosperity continued to be dependent on markets in Mesopotamia. After Baghdad emerged as the seat of the caliph in 750 and the main centre of Islamic civilization, Bahrain greatly benefited from the city's increased demand for foreign goods especially from China and South Asia. Bahrain became a hub for intellectuals for hundreds of years stretching from the early days of Islam in the 6th century to the 18th century. Philosophers of Bahrain were highly esteemed, such as the 13th century mystic, Sheikh Maitham Al Bahrani (died in 1299). Around the year 900, Abu Sa'id al-Hasan al-Jannabi led the Qarmatian revolution, a rebellion by a messianic Ismaili sect originating in Kufa in present-day Iraq. Al-Jannabi took over the city of Hajr, Bahrain's capital at that time, and al-Hasa, which he made the capital of his republic. Once in control of the state he sought to create a utopian society. The Qarmatians' goal was to build a society based on reason and equality. The state was governed by a council of six with a chief who was a first among equals. All property within the community was distributed evenly among all initiates. The Qarmatians were organized as an esoteric society but not as a secret one; their activities were public and openly propagated, but new members had to undergo an initiation ceremony involving seven stages. The Qarmatian world view was one where every phenomenon repeated itself in cycles, where every incident was replayed over and over again. Even before taking over Bahrain, the Qarmatians had instigated what some scholars have termed a 'century of terrorism' in Kufa. From Bahrain they launched raids along the pilgrim routes crossing Arabia: in 906 they ambushed the pilgrim caravan returning from Mecca and massacred 20,000 pilgrims. Under Abu Tahir al-Jannabi they came close to capturing Baghdad in 923, and sacked Mecca in 930. In the assault on Islam's holiest sites, the Qarmatians desecrated the Well of Zamzam with corpses of Hajj pilgrims, and took the Black Stone from Mecca to al-Hasa. According to historian al-Juwayni, the stone was returned 22 years later in 951 under mysterious circumstances. Wrapped in a sack, it was thrown into the Great Mosque of Kufa in Iraq, accompanied by a note saying "By command we took it, and by command we have brought it back." The theft and removal of the Black Stone caused it to break into seven pieces. The sack of Mecca followed millenarian excitement among the Qarmatians (and in Persia) over the conjunction of Saturn and Jupiter in 928. Bahrain became the seat of the Qarmatian Mahdi-Caliph from Isfahan who abolished Sharīa law. The new Mahdi also changed the qibla of prayer from Mecca to that of fire, a specifically Zoroastrian practice. Some scholars take the view that "they may not have been Isamailis at all at the outset, and their conduct and customs gave plausibility to the belief that they were not merely heretics but bitter enemies of Islam." The Qarmatians were defeated in battle in 976 by the Abbasids, which encouraged them to look inward to build their utilitarian society. Around 1058, a revolt on the island of Bahrain led by two Shi'a members of the Abd al-Qays tribe, Abul-Bahlul al-'Awwam and Abu'l-Walid Muslim, precipitated the waning of Qarmatian power and eventually the ascendancy to power of the Uyunids, an Arab dynasty belonging to the Abdul Qays tribe. In 1076–1077, Sheikh Abdullah bin Ali Al Uyuni seized the country from the Qarmatians in Bahrain and Al-Hasa with the military assistance of Great Seljuq Empire and founded the Uyunid dynasty and established the Uyunid Emirate. The Uyunid dynasty, ruled Bahrain for 163 years, from the 11th to the 13th centuries. Their sect is disputed; some sources mention they were Shia, others Sunni. They were the remnants of Bani Abdul Qays tribe. The state of Al-Hasa was the first capital of the Uyunid Emirate. Then Al-Fadhl, son of Abdullah, transfers his capital to Qatif, then to Awal (today’s state of Bahrain). In his reign, the state extended to Kuwait. Then in 513 H. the Capital went back to Qatif. Then in 531 H. Mohammed son of Al Fadhl 1 is assassinated there for the state was divided into two, one in Al-Hasa and the other in Al-Qatif. Under Muhammad b. Ahmad b. Abu'l-Hussin b. Abu Sinan, the Uyunid's territory stretched from Najd to the Syrian desert. Due to the influence of the Uyunid kingdom, Caliph al-Nasir li-Din Allah gave Muhammad b. Ahmad authority to protect the pilgrimage route to Mecca. Muhammad was later murdered by a family member, instigated by his cousin, Gharir b. Shukr b. Ali. In the years 587 – 605 H. Mohammed bin Abi Al-hussain unites Qatif and Al-Hasa. The country was ruled by the Uyunid dynasty for 163 years. In 1253 C. Conflicts inside the Uyunid family gave the chance to the Bedouin Usfurids of Banu Uqayl to establish their state and destroy the Uyunid State. Thereby gaining control over eastern Arabia, including the islands of Bahrain. The famous poet Ali bin al Mugrab Al Uyuni is a descendant of the Uyunids. In 1253, the Bahrani dynasty of the Usfurids of Banu Uqayl — named after its founder, Usfur ibn Rashid — gained control over eastern Arabia, including the islands of Bahrain. The late Middle Ages were a time of chronic instability with local disputes allowing various Persian-based Arab Kingdoms based in Qais, Qishm and Hormuz to involve themselves in Bahrain's affairs. In 1330, the islands became tributary to the rulers of Hormuz. According to historian Juan Cole it was under Sunni rule that Twelver Shiaism became established in Bahrain, as Shia Bahrainis gradually moved away from the radical, egalitarian Ismaili Qarmatian sect to the more quietist Twelver or Imami branch, a process which the Sunni rulers encouraged. But even in the 14th century, the North African traveller Ibn Battuta visiting Qatif around 1331, found it inhabited by Arabs whom he described as "extremist Shi'is" (rafidiyya ghulat), which Cole presumes is how a 14th-century Sunni would describe Ismailis. Ibn Battuta also noted the great wealth of the area thanks to the pearling industry. Until the late Middle Ages, "Bahrain" referred to the larger historical region of Bahrain. Ibn Battuta's 14th-century account contains an early use of the term "Bahrain" to refer solely to the Awal islands. 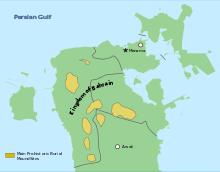 However, the exact date at which the term "Bahrain" began to refer solely to the Awal archipelago is unknown. In the mid-15th century, another branch of the Banu Uqayl, led by Zamil ibn Jabir, wrested control of Bahrain, founding the dynasty of the Bedouin Jabrids. Based in al-Ahsa, the Jabrids ruled most of eastern Arabia and followed the Sunni Maliki rite, which they actively promoted within their domain. The Portuguese Fort in 1870. The Arab navigator, Ahmad Bin Majid, visited Bahrain in 1489 and gave a contemporary account of the country that the first Portuguese would have seen: "In Awal (Bahrain) there are 360 villages and fresh water can be found in a number of places. A most wonderful al-Qasasir, where a man can dive into the salt sea with a skin and can fill it with fresh water while he is submerged in the salt water. Around Bahrain are pearl fisheries and a number of islands all of which have pearl fisheries and connected with this trade are 1,000 ships". Portuguese expansion into the Indian Ocean in the early 16th century followed Vasco da Gama's voyages of exploration in which the Portuguese battled the Ottomans up the coast of the Persian Gulf. The Portuguese, drawn in by the lucrative trade routes of the Gulf, sought control of the strategic Ormus region before setting its sights on Bahrain. Portuguese ships first entered the Gulf in 1485, the first reputed Portuguese traveller to visit Bahrain was Duarte Barbosa. After the Kingdom of Hormuz fell in 1507, Hormuz' political control of Bahrain was lost after the island fell to the princes of Al-Hasa. A combined Portuguese-Hormuz force led by António Correia conquered Bahrain in 1521 only to briefly lose it to the princes of Al-Hasa the same year. In response, the Portuguese sent another expedition to Bahrain and the Arabian coast to subdue the Al-Hasa attempts to regain power. 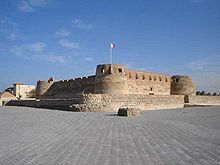 The Portuguese later consolidated their position of the island by reconstructing the Qal'at al Bahrain fortress, which was to serve as the base for the Portuguese garrison. It is believed that the Portuguese ruled the islands via indirect rule, with some force, against the inhabitants for eighty years, despite incurring several revolts and protests (one of which resulted in temporary independence in 1534). Such a revolt was the rebellion of 1529 saw the deployment of a 400-man Portuguese force sent to subdue the island. Except for a brief period in 1559 when the governor of the Ottoman province of Al-Hasa tried to occupy the islands but were repelled, the Portuguese remained in control until they were driven out of the island in 1602, when a popular uprising led by Rukn ed-Din took control of the Bahrain Fort. The uprising was sparked by the governor's order of the execution of the island's richest traders. Portuguese attempts to retake Bahrain were thwarted due to aid from the prince of Shiraz. The uprising coincided with regional disputes between the Portuguese and rival European powers. The power vacuum that resulted was almost immediately filled by the Persian ruler, Shah Abbas I, who deployed a Persian garrison to the Bahrain Fort and subsumed it within the Safavid Empire. 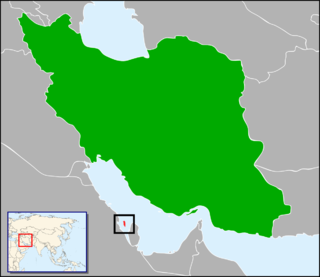 Under Persian Safavid rule (1602–1717), Bahrain fell under the administrative jurisdiction of the Beglarbegi of Kuhgilu centered at Behbahan in southern Iran. In fact, the Safavids ruled Bahrain from a distance, seeking to control the islands not by force, but through ideology and the manipulation of local rivalries. Safavid rule was a period of intellectual flowering among the Shia theological elite, with Bahrain's seminaries producing such theorists as Sheikh Yusuf Al Bahrani. The Safavid's used the clergy to buttress their rule, hoping that by firmly implanting Imami Shiaism they could secure the islands of Bahrain, with their centrality to trade routes and pearl wealth. However, the Safavids' strategy was in many ways too successful: the power and influence of the religious class meant that they had a great deal of autonomy, and it was the subsequent tension between Safavid state and the clergy that drove Bahrain's theological vitality. Part of this flourishing was borne of the Bahraini clerics' adherence to conservative Akhbari Shiaism, while the Safavids encouraged the more state-centric, Usulism. Attempts by the Persians to reign in the Bahraini ulema were often counterproductive, and ended up strengthening the clerics against their local land-owning Bahraini rivals who challenged the clerics' control over the lucrative pearl trade. Cleric-landowner conflict was usually contained within very limited parameters given that the senior ulema were usually the sons of the land-owning class. An Afghan invasion of Iran at the beginning of the 18th century resulted in the near collapse of the Safavid state. In the resultant power vacuum, Oman invaded Bahrain in 1717, ending over a hundred years of Persian hegemony. The Omani invasion began a period of political instability and a quick succession of outside rulers took power with consequent destruction. According to a contemporary account by theologian, Sheikh Yusuf Al Bahrani, in an unsuccessful attempt by the Persians and their Bedouin allies to take back Bahrain from the Kharijite Omanis, much of the country was burnt to the ground. Bahrain was eventually sold back to the Persians by the Omanis, but the weakness of the Safavid empire saw Huwala tribes seize control. In 1730, the new Shah of Persia, Nader Shah, sought to re-assert Persian sovereignty in Bahrain. He ordered Latif Khan, the admiral of the Persian navy in the Persian Gulf, to prepare an invasion fleet in Bushehr. The Persians invaded in March or early April 1736 when the ruler of Bahrain, Shaikh Jubayr, was away on hajj. The invasion brought the island back under central rule and to challenge Oman in the Persian Gulf. He sought help from the British and Dutch, and he eventually recaptured Bahrain in 1736. During the Qajar era, Persian control over Bahrain waned and in 1753, Bahrain was occupied by the Arabs of Abu Shahr of the Bushire-based Al Madhkur family, who ruled Bahrain in the name of Persia and paid allegiance to Karim Khan Zand. The years of almost constant warfare and instability in the period led to a demographic collapse – German geographer Carsten Niebuhr found in 1763 that Bahrain's 360 towns and villages had, through warfare and economic distress, been reduced to only 60. The influence of Iran was further undermined at the end of the 18th century when the ideological power struggle between the Akhbari-Usuli strands culminated in victory for the Usulis in Bahrain. In 1797, fourteen years later after gaining the power of the Bani Utbah, the Al Khalifa family moved to Bahrain and settled in Jaww, later moving to Riffa. They were originally from Kuwait having left in 1766. Al-Sabah family traditions relates that the ancestors of their family and those of the Al-Khalifa family came to Kuwait after their expulsion from the Iraqi Umm Qasr town upon Khor Zubair by the Turks, an earlier base from which they preyed on the caravans of Basra and pirated ships in the Shatt al-Arab waterway. The first ruler of the Al Khalifa was Shaikh Ahmed Al-Fateh. In 1820, the Al Khalifa tribe regained power in Bahrain and entered a treaty relationship with Great Britain, by then the dominant military power in the Persian Gulf. This treaty recognised the Al Khalifa as the rulers ("Al-Hakim" in Arabic) of Bahrain. It was the first of several treaties including the 1861 Perpetual Truce of Peace and Friendship, which was further revised in 1892 and 1951. From this perspective state building under the Al Khalifa shayks should not be considered exclusively as the result of Britain's informal empire in the Persian Gulf. In fact, it was a long process of strategic negotiation with different sections of the local population in order to establish a pre-eminence of their particularly artistic Sunni/Bedouin tradition of family rule. After the Egyptian ruler, Mohammad Ali Pasha took the Arabian Peninsula from the Wahhabis on behalf of the Ottoman Empire in 1830, the Egyptian army demanded yearly tributes from Sheikh Abdul Al Khalifa. He had earlier sought Persian and British protection from the Egyptians. The Sheikh agreed to the terms of the Egyptians. In 1860, the Government of Al Khalifa used the same tactic when the British tried to overpower Bahrain. Sheikh Mohammad bin Khalifa Al Khalifa wrote letters to both the Persian Prince-Governor of Fars and to the Ottoman Wali of Baghdad, to place Bahrain in the protection of each respective state. Both sides sent wakils (a person who is an authorised representative), who offered the Sheikh their conditions, of which the Ottoman terms were more beneficial and was accepted in March 1860. In another letter to the Iranian Foreign Minister, Sheikh Mohammad demanded that the Government of Iran provide direct guidance and protection from British pressure. Later on, under pressure from Colonel Sir Lewis Pelly, Sheikh Mohammad requested military assistance from Iran, but the Government of Iran at that time provided no aid to protect Bahrain from British aggression. As a result, the Government of British India eventually overpowered Bahrain. Colonel Pelly signed an agreement with Sheikh Mohammad in May 1861 and later with his brother Sheikh Ali that placed Bahrain under British rule and protection. In 1868, following the Qatari–Bahraini War, British representatives signed another agreement with the Al Khalifa rulers, making Bahrain part of the British protectorate territories in the Persian Gulf. It specified that the ruler could not dispose of any of his territory except to the United Kingdom and could not enter into relationships with any foreign government without British consent. In return the British promised to protect Bahrain from all aggression by sea and to lend support in case of land attack. More importantly the British promised to support the rule of the Al Khalifa in Bahrain, securing its unstable position as rulers of the country. Other agreements in 1880 and 1892 sealed the protectorate status of Bahrain to the British. Mixed with the indigenous population [of Manamah] are numerous strangers and settlers, some of whom have been established here for many generations back, attracted from other lands by the profits of either commerce or the pearl fishery, and still retaining more or less the physiognomy and garb of their native countries. Thus the gay-coloured dress of the southern Persian, the saffron-stained vest of Oman, the white robe of Nejed, and the striped gown of Bagdad, are often to be seen mingling with the light garments of Bahreyn, its blue and red turban, its white silk-fringed cloth worn Banian fashion round the waist, and its frock-like overall; while a small but unmistakable colony of Indians, merchants by profession, and mainly from Guzerat, Cutch, and their vicinity, keep up here all their peculiarities of costume and manner, and live among the motley crowd, 'among them, but not of them'. Map of Manama in 1926. Palgrave's description of Manama's coffee houses in the mid-19th century portrays them as cosmopolitan venues in contrast to what he describes as the 'closely knit and bigoted universe of central Arabia'. Palgrave describes a people with an open – even urbane – outlook: "Of religious controversy I have never heard one word. In short, instead of Zelators and fanatics, camel-drivers and Bedouins, we have at Bahrain [Manama] something like 'men of the world, who know the world like men' a great relief to the mind; certainly it was so to mine." The great trading families that emerged during this period have been compared to the Borgias and Medicis and their great wealth – long before the oil wealth for which the region would later be renowned – gave them extensive power, and among the most prominent were the Persian Al Safar family, who held the position of Native Agents of Britain in the 19th century. The Al Safar enjoyed an 'exceptionally close' relationship with the Al Khalifa clan from 1869, although the al-Khalifa never intermarried with them – it has been speculated that this could be related to political reasons (to limit the Safars' influence with the ruling family) and possibly for religious reasons (because the Safars were Shia). As a result of Bahrain's trade with India, the cultural influence of the subcontinent grew dramatically, with styles of dress, cuisine, and education showing a marked Indian influence. According to Exeter University's James Onley "In these and countless other ways, eastern Arabia's ports and people were as much a part of the Indian Ocean world as they were a part of the Arab world." Coronation of Hamad bin Isa Al Khalifa as the Hakim of Bahrain in 1933. Unrest amongst the people of Bahrain began when Britain officially established complete dominance over the territory in 1892. The first revolt and widespread uprising took place in March 1895 against Sheikh Issa bin Ali, then ruler of Bahrain. Sheikh Issa was the first of the Al Khalifa to rule without Iranian relations. Sir Arnold Wilson, Britain's representative in the Persian Gulf and author of The Persian Gulf, arrived in Bahrain from Mascat at this time. The uprising developed further with some protesters killed by British forces. Bahrain underwent a period of major social reform between 1926 and 1957, under the de facto rule of Charles Belgrave, the British advisor to Shaikh Hamad ibn Isa Al-Khalifa (1872-1942). The country's first modern school was established in 1919, with the opening of the Al-Hiddaya Boys School, while the Persian Gulf's first girls school opened in 1928. The American Mission Hospital, established by the Dutch Reform Church, began work in 1903. Other reforms include the abolition of slavery, while the pearl diving industry developed at a rapid pace. These reforms were often vigorously opposed by powerful groups within Bahrain including sections within the ruling family and merchants. In order to counter conservatives, the British removed the Ruler, Isa ibn Ali Al Khalifa in 1923 and replaced him with his son. Some Sunni families left Bahrain to mainland Arabia, whilst clerical opponents of social reforms were exiled to Saudi Arabia and Iran. The heads of some merchant and notable families were likewise exiled. Britain's interest in Bahrain's development was motivated by concerns over the ambitions of the Saudi-Wahabi and the Iranians. The discovery of oil in 1932 by Bahrain Petroleum Company brought rapid modernisation to Bahrain. Relations with the United Kingdom became closer, as evidenced by the British Royal Navy moving its entire Middle Eastern command from Bushehr in Iran to Bahrain in 1935. British influence continued to grow as the country developed, culminating with the appointment of Charles Belgrave as advisor. He went on to establish a modern education system in Bahrain. Bahrain participated in the Second World War on the Allied side, joining on 10 September 1939. On 19 October 1940, four Italian SM.82s bombers bombed Bahrain alongside Dhahran oilfields in Saudi Arabia, targeting Allied-operated oil refineries. Although only some damage was caused in both locations, the attack forced the Allies to upgrade Bahrain's defences which further stretched Allied military resources. After World War II, increasing anti-British sentiment spread throughout the Arab World and led to riots in Bahrain. The riots focused on the Jewish community, which included distinguished writers, singers, accountants, engineers and middle managers working for the oil company, textile merchants with business all over the peninsula, and free professionals. The National Union Committee (NUC), a leftist nationalist movement associated with the labour unions, was formed in 1954 calling for the end of British interference and political reforms. Work sites were plagued with frequent strikes and occasional riots (including several fatalities) during this period. Following riots in support of Egypt defending itself against the tripartite invasion during 1956 Suez Crisis, the British decided to put an end to the NUC challenge to their presence in Bahrain. The NUC and its offshoots were declared illegal. Its leaders were arrested, tried and imprisoned. Some fled the country while others were forcibly deported. Strikes and riots continued during the 1960s, now under the leadership of underground cells of the NUC, namely the communist National Liberation Front and the Popular Front for the Liberation of Bahrain, the Bahraini section of the Arab Nationalist Movement. In March 1965, an uprising broke out, called the March Intifada, against the British presence in Bahrain. The spark of the riots was the laying off of hundreds of Bahraini workers at the Bahrain Petroleum Company. Several people died in the sometimes violent clashes between protesters and police. The emir Isa bin Salman Al Khalifa heads the opening session of the first conference on the formation of a union of the Gulf emirates in February 1968. After World War II, Bahrain became the centre for British administration of the lower Persian Gulf. In 1968, when the British Government announced its decision to end the treaty relationships with the Persian Gulf sheikdoms, Bahrain joined with Qatar and the seven Trucial States (which now form the United Arab Emirates) under British protection in an effort to form a union of Arab emirates. By mid-1971, however, the nine sheikhdoms still had not agreed on the terms of union. Accordingly, Bahrain sought independence as a separate entity. 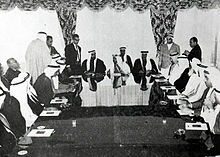 In 1969, both the British and Iranian governments agreed to approach the United Nations Secretariat to resolve the dispute of Bahrain's sovereignty. In early 1970, the Iranian government asked the UN general secretary to assess the will of the Bahraini people with regards to their sovereignty. The survey (sometimes referred to as a "referendum") took the form of a United Nations poll on whether islanders preferred independence or Iranian control. The report of the Personal Representative of the Secretary-General on the consultation stated that "the overwhelming majority of the people of Bahrain wish to gain recognition of their identity in a full independent and sovereign State free to decide for itself its relations with other States." As a result, the United Nations Security Council unanimously passed Resolution 278 on 11 May 1970, while in the same month Iran renounced its claim to the island. The country subsequently became independent from the United Kingdom, declaring independence on 15 August 1971, and becoming formally independent as the State of Bahrain on 16 December 1971. At independence, the permanent Royal Navy presence in Bahrain ended and the United States Navy moved onto the 10 acres (40,000 m2) previously occupied by British operations. The installation later grew into Naval Support Activity Bahrain, headquarters for the United States Fifth Fleet. The emirate emerged just as the price of oil skyrocketed after the 1973 Yom Kippur War; while Bahrain's own reserves were being depleted the high oil price meant there was massive capitalisation in the Kingdom's neighbours. The Kingdom was able to exploit the situation thanks to another war in the Levant in 1975: the Lebanese Civil War. Beirut had long been the financial centre of the Arab world, but the outbreak of hostilities in the country had an immediate impact on the banking industry. Bahrain offered a new location at the centre of the booming Persian Gulf with a large educated indigenous workforce and sound fiscal regulations. Realizing the opportunity to become a financial centre resulted in growth in other industries in the country. This bolstered the development of the middle class and gave Bahrain a very different class structure from its tribal dominated neighbours. Although there had long been a large Indian presence in Bahrain, it was at this time that mass migration to the Kingdom began to take off with subsequent consequences for the Kingdom's demographics. Large numbers of immigrants from Third World countries such as the Philippines, Pakistan, Egypt, and Iran were attracted by better salaries than at home. Based on its new constitution, Bahraini men elected its first National Assembly in 1973 (although Article 43 of the 1973 Constitution states that the Assembly is to be elected by "universal suffrage", the conditional clause "in accordance with the provisions of the electoral law" allowed the regime to prevent women from participating). Although the Assembly and then-Emir Isa ibn Salman al-Khalifa quarrelled over a number of issues (foreign policy; the U.S. naval presence, and the budget), the biggest clash came over the State Security Law (SSL). The Assembly refused to ratify the government-sponsored law, which allowed, among other things, the arrest and detention of people for up to three years, (renewable) without a trial. The legislative stalemate over this act created a public crisis, and on 25 August 1975, the emir dissolved the Assembly. The emir then ratified the State Security Law by decree, and suspended those articles in the constitution dealing with the legislative powers of the Assembly. In that same year, the emir established the State Security Court, whose judgments were not subject to appeal. The tide of political Islam that swept the Middle East in the 1970s, culminating in the Iranian Revolution in 1979 was to have profound implications for Bahrain's social and political development. There were a number of factors that had caused Bahrain to be more liberal than its neighbours, but these were challenged by the rise of Islamic religious fundamentalism. Bahrain's pluralist traditions were to a large extent a result of the complex confessional and demographic makeup of the country, which required Shi'a Moslems Arabs, Sunni Moslem Arabs, ethnic Farsis (Huwala), and Iranian Arabs (Ajams), and a plethora of minority faiths, to live and work together. This tolerance had been buttressed by the prominence of Arab nationalism and Marxism as the main modes of dissent, both of which were socially progressive and downplayed religious affiliations. The country's traditional dependence on trade further encouraged openness. It was the political earthquake represented by the Shah's fall that changed the dynamics of Bahrain's politics. In 1981, the Islamic Front for the Liberation of Bahrain (an alleged Iranian front organisation), attempted a coup d'état. Thei goal was the assassination of Bahrain's leadership and installing an Islamist theocracy with a cleric as supreme leader. The attempted coup and the outbreak of the Iran–Iraq War led to the formation of the Gulf Cooperation Council, which Bahrain joined with Kuwait, Oman, Qatar, Saudi Arabia, and the United Arab Emirates. The sense of regional uncertainty was further heightened when Saddam Hussein's Iraq invaded Kuwait, triggering the 1991 Persian Gulf War. The 1990s saw growing criticism of the lack of democratic reforms. The unrest resulted in approximately forty deaths and ended after Hamad ibn Isa Al Khalifa became the Emir in 1999. The emir appointed a 30-member Consultative Council for a four-year term in December 1992. Demonstrations followed the arrest of Shia cleric, Sheikh Ali Salman, on 5 December 1994 after he called for the restoration of the National Assembly and criticised the ruling family. A group of youths clashed with police after throwing stones at female runners during an international marathon for running bare-legged. In January 1995, Sheikh Ali Salman was deported and sought asylum in Britain. A cabinet reshuffle in June 1995, brought five Shia ministers into the government. Shia cleric, Sheikh Abdul Amir al-Jamri, arrested in April 1995, was released five months later. After bomb explosions in Manama's business quarter, Al-Jamri was arrested again on 18 January 1996. A Sunni lawyer and poet, Ahmad al-Shamlan, was also detained on 8 February, but released in April. In June 1996, the government claimed it had uncovered another Iranian-backed coup plot by a group called "Hezbollah-Bahrain". Bahrain recalled its ambassador to Iran and downgraded its representation to chargé d'affaires level. In September 1996 the Consultative Council was increased from 30 to 40 members. The political impasse continued over the next few years during which time the regime dealt with its opponents using severe repression. Bomb attacks and police brutality marked this period in which over forty people were killed in violence between the two sides. Although the violence was never entirely stopped by the security measures, it was contained and continued as low-level intermittent disturbances. In December 1998 Bahrain provided military facilities for "Operation Desert Fox", the US and UK bombing campaign against Iraq. The emir, Sheikh Isa, died in March 1999, and was succeeded by his eldest son, Hamad bin Isa Al Khalifa. Sheikh al-Jamri was sentenced to 10 years' imprisonment in July 1999, but then pardoned by the new Emir. For the first time, non-Muslims (a Christian and a Jewish businessman) and four women were appointed to the Consultative Council in September 2000. In 2001 Bahrainis strongly backed proposals put by the emir – now the king – to turn the country into a constitutional monarchy with an elected parliament and an independent judiciary. A referendum on 14–15 February 2001 massively supported the National Action Charter. The emir gave women the right to vote, and released all political prisoners. 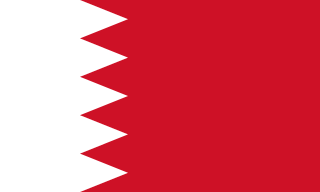 As part of the adoption of the National Action Charter on 14 February 2002, Bahrain changed its formal name from the State (dawla) of Bahrain to the Kingdom of Bahrain. Local elections were held in May 2002. For the first time women could vote and stand as candidates, but failed to win a seat. Parliamentary elections – the first such in nearly 30 years – were held in October 2002 for a 40-member parliament, the Council of Deputies, which included a dozen Shia MPs. Authorities said the turnout was more than 50% despite a call by critics for a boycott. In May 2003 thousands of victims of alleged torture petitioned the king to cancel a law which prevents them from suing suspected torturers. Nada Haffadh was made health minister in April 2004 – the first woman to head a government ministry. The following month, protests in Manama against fighting in the Iraqi holy cities of Najaf and Karbala saw the king sack his interior minister after police tried to prevent the protest. In March–June 2005, thousands of protest marchers demanded a fully elected parliament. In the general election of November 2006, the Shia opposition won 40% of the seats. A Shia Muslim, Jawad Al-Arrayedh, was named as a deputy prime minister. A Jewish woman, Houda Nonoo, was appointed Bahrain's ambassador to the USA in 2008 May. She is believed to be the Arab world's first Jewish ambassador. Authorities arrest several people who allegedly planned to detonate homemade bombs during Bahrain's national celebrations in December 2008. In April 2009, the King pardoned more than 170 prisoners charged with endangering national security, including 35 Shias being tried on charges of trying to overthrow the state. However, in September 2010, in the run up to the elections, 20 Shia opposition leaders were arrested and accused of plotting to overthrow monarchy by promoting violent protests and sabotage. In the October parliamentary elections, the main Shia opposition group, Al Wefaq, could make only slender gains. The country participated in military action against the Taliban in October 2001 by deploying a frigate in the Arabian Sea for rescue and humanitarian operations. As a result, in November of that year, US president George W. Bush's administration designated Bahrain as a "major non-NATO ally". Bahrain opposed the invasion of Iraq and had offered Saddam Hussein asylum in the days prior to the invasion. Relations improved with neighbouring Qatar after the border dispute over the Hawar Islands was resolved by the International Court of Justice in The Hague in 2001. Bahrain negotiated a free trade agreement with the United States in 2004, although Saudi Arabia criticized the move, saying it hindered regional economic integration. Qatar and Bahrain have made plans to build the Qatar-Bahrain Friendship Bridge to link the countries across the Persian Gulf, which would be the longest fixed-link bridge in the world if completed. Over 100,000 of Bahrainis taking part in the "March of Loyalty to Martyrs", honoring political dissidents killed by security forces, on 22 February. The protests in Bahrain started on 14 February, and were initially aimed at achieving greater political freedom and respect for human rights; they were not intended to directly threaten the monarchy. (pp162–3) Lingering frustration among the Shiite majority with being ruled by the Sunni government was a major root cause, but the protests in Tunisia and Egypt are cited as the inspiration for the demonstrations. (p65) The protests were largely peaceful until a pre-dawn raid by police on 17 February to clear protestors from Pearl Roundabout in Manama, in which police killed four protesters. (pp73–4) Following the raid, some protesters began to expand their aims to a call for the end of the monarchy. On 18 February army forces opened fire on protesters when they tried to reenter the roundabout, fatally wounding one. (pp77–8) The following day protesters reoccupied Pearl Roundabout after the government ordered troops and police to withdraw. (p81) Subsequent days saw large demonstrations; on 21 February a pro-government Gathering of National Unity drew tens of thousands,(p86) whilst on 22 February the number of protestors at the Pearl Roundabout peaked at over 150,000 after more than 100,000 protesters marched there. (p88) On 14 March, Saudi-led GCC forces were requested by the government and entered the country,(p132) which the opposition called an "occupation". King Hamad bin Isa Al Khalifa declared a three-month state of emergency on 15 March and asked the military to reassert its control as clashes spread across the country. (p139) On 16 March, armed soldiers and riot police cleared the protesters' camp in the Pearl Roundabout, in which 3 policemen and 3 protesters were reportedly killed. (pp133–4) Later, on 18 March, the government tore down Pearl Roundabout monument. (pp150) After the lifting of emergency law on 1 June, several large rallies were staged by the opposition parties. Smaller-scale protests and clashes outside of the capital have continued to occur almost daily. On 9 March 2012 over 100,000 protested in what the opposition called "the biggest march in our history". The police response has been described as a "brutal" crackdown on "peaceful and unarmed" protestors, including doctors and bloggers. The police carried out midnight house raids in Shia neighbourhoods, beatings at checkpoints, and denial of medical care in a "campaign of intimidation". More than 2,929 people have been arrested, and at least five people died from torture while in police custody. (p287,288) On 23 November 2011 the Bahrain Independent Commission of Inquiry released its report on its investigation of the events, finding that the government had systematically tortured prisoners and committed other human rights violations. (pp415–422) It also rejected the government's claims that the protests were instigated by Iran. Although the report found that systematic torture had stopped,(pp417) the Bahraini government has refused entry to several international human rights groups and news organizations, and delayed a visit by a UN inspector. More than 120 people had died since the start of the uprising. ^ "Background Notes: Mideast, March, 2011". US Department of State. 2011. p. 100. ^ a b Larsen, Curtis E. (1983). Life and Land Use on the Bahrain Islands: The Geoarchaeology of an Ancient Society. University of Chicago Press. p. 50–51. ISBN 978-0-226-46906-5. ^ "Traces of Paradise: The Archaeology of Bahrain, 2500 BC to 300 AD". Harriet Crawford, Michael Rice. 2000. p. 217. ^ a b c d e Mouthed-Zadeh, Pirouz (5 November 2013). Security and Territoriality in the Persian Gulf: A Maritime Political Geography. Taylor & Francis. pp. 119 and others. ISBN 978-1-136-81724-3. ^ Larsen, Curtis E. (1983). Life and Land Use on the Bahrain Islands: The Geoarchaeology of an Ancient Society. University of Chicago Press. p. 33. ISBN 978-0-226-46906-5. ^ P. T. H. Unwin; Tim Unwin (18 June 1996). Wine and the Vine: An Historical Geography of Viticulture and the Wine Trade. Psychology Press. pp. 80–. ISBN 978-0-415-14416-2. Retrieved 31 May 2011. ^ Thorkild Jacobsen (23 September 1997). The Harps that once--: Sumerian poetry in translation, p. 150. Yale University Press. ISBN 978-0-300-07278-5. Retrieved 2 July 2011. ^ a b Larsen, Curtis E. (1983). Life and Land Use on the Bahrain Islands: The Geoarchaeology of an Ancient Society. University of Chicago Press. p. 13. ISBN 978-0-226-46906-5. ^ I.M.N. Al-Jubouri, Jubūrī, History of Islamic Philosophy Authors Online Ltd 2004, p. 172. ^ John Joseph Saunders, p. 130. ^ "Qarmatiyyah". Overview of World Religions. St. Martin's College. Archived from the original on 28 April 2007. Retrieved 4 May 2007. ^ "Black Stone of Mecca". Encyclopædia Britannica. 2007. Encyclopædia Britannica Online. 25 June 2007. ^ Clifford Bosworth, The New Islamic Dynasties: A Genealogical and Chronological Manual, Edinburgh University Press, 2004, p. 95. ^ Commins, David (2012). The Gulf States: A Modern History. I.B. Tauris. p. 28. ISBN 978-1848852785. ^ C.E. Bosworth, The New Islamic Dynasties, (Columbia University Press, 1996), 94–95. ^ A Thirteenth Century Poet from Bahrain, Safa Khulusi, Proceedings of the Seminar for Arabian Studies, 92. ^ Larsen, Curtis E. (1983). Life and Land Use on the Bahrain Islands: The Geoarchaeology of an Ancient Society. University of Chicago Press. p. 66. ISBN 978-0-226-46906-5. ^ Ibn Battuta, Rih1a Ibn Battuta Beirut: Dar Sadir, 1964 pp. 279–80. ^ a b Rentz, G. "al- Baḥrayn". ^ a b c d Larsen, Curtis E. (1983). Life and Land Use on the Bahrain Islands: The Geoarchaeology of an Ancient Society. University of Chicago Press. p. 68. ISBN 978-0-226-46906-5. ^ Larsen, Curtis E. (1983). Life and Land Use on the Bahrain Islands: The Geoarchaeology of an Ancient Society. University of Chicago Press. p. 69. ISBN 978-0-226-46906-5. ^ According to the Cambridge History of Islam, it conflictingly states that the Ottomans conquered Bahrain in 1554, contradicting other sources. ^ Bashir, Sani Ali (1981). "A study of Al-Khalifah's rule in Bahrain, 1783–1820" (Thesis). McGill University. p. 4. Retrieved 23 May 2016. ^ Bashir, Sani Ali (1981). "A study of Al-Khalifah's rule in Bahrain, 1783–1820" (Thesis). McGill University. p. 6. Retrieved 23 May 2016. ^ a b c d Bashir, Sani Ali (1981). "A study of Al-Khalifah's rule in Bahrain, 1783–1820" (Thesis). McGill University. p. 7. Retrieved 23 May 2016. ^ a b c d e f g h i j k l Bashir, Sani Ali (1981). "A study of Al-Khalifah's rule in Bahrain, 1783–1820" (Thesis). McGill University. Retrieved 23 May 2016. ^ Arabian Gulf Intelligence: Selections from the Records of the Bombay Government No. XXIV. ^ Al-Baharna, Husain (1968). Legal Status of the Arabian Gulf States: A Study of Their Treaty Relations and Their International Problems. Manchester University Press. p. 31. ISBN 0719003326. ^ a b c d e f g Pridham, B.R. (2004). New Arabian Studies, Volume 6. University of Exeter Press. pp. 51, 52, 53, 67, 68. ISBN 0859897060. ^ Pridham, B. R. (1985). The Arab Gulf and the West. Croom Helm. pp. `7. ISBN 0709940114. ^ a b c Wilson, Arnold T. The Persian Gulf. Routledge. ISBN 1136841059. ^ Larsen, Curtis E. (1983). Life and Land Use on the Bahrain Islands: The Geoarchaeology of an Ancient Society. University of Chicago Press. p. 72. ISBN 978-0-226-46906-5. ^ a b c Mojtahed-Zadeh, Pirouz (1999). Security and Territoriality in the Persian Gulf: A Maritime Political Geography. Routledge. p. 130. ISBN 0700710981. ^ "Bahrain Education". Retrieved 17 June 2012. ^ "Bahrain's Re-Reform Movement". Foreign Affairs. Retrieved 17 June 2012. ^ "Bahrain: Discovery of Oil". January 1993. Retrieved 22 March 2011. ^ "Bahrain". Retrieved 22 March 2011. ^ "Italian Air Raid!". Archived from the original on 3 October 2012. Retrieved 2 October 2012. ^ "Italian Raid on Manama 1940". Archived from the original on 16 October 2012. Retrieved 25 July 2012. ^ a b c "Bahrain profile". BBC News. 19 September 2013. ^ Darwish, Adel (March 1999). "Rebellion in Bahrain". Middle East Review of International Affairs. 3 (1). Archived from the original on 3 October 2012. Retrieved 2 October 2012. ^ Malik, Adnan (14 December 2002). "Bahrain's monarch opens parliament after a span of nearly 30 years". Associated Press (via HighBeam Research). Archived from the original on 17 January 2013. Retrieved 6 October 2012. ^ Darwish, Adel (1 March 1999). "Bahrain remains stable despite arson attacks that took place in the country". The Middle East. Retrieved 5 October 2012 – via Questia Online Library. ^ "The Rich/Poor & Sunni/Shiite Rift". APS Diplomat. – via HighBeam Research (subscription required). 18 March 2002. Archived from the original on 17 January 2013. Retrieved 5 October 2012. ^ Adel Darwish. "Middle East Review of International Affairs". Archived from the original on 5 May 2006. ^ "Country Theme: Elections: Bahrain". UNDP-Programme on Governance in the Arab Region. 2011. Archived from the original on 10 May 2011. Retrieved 9 February 2011. ^ "Bahrain: Promising human rights reform must continue" (PDF). Amnesty International. 13 March 2001. Retrieved 9 February 2011. ^ "The Kingdom of Bahrain: The Constitutional Changes". The Estimate: Political and Security Analysis of the Islamic World and its Neighbors. 22 February 2002. Archived from the original on 3 October 2009. Retrieved 17 February 2011. ^ a b c The Middle East and North Africa 2004. Europa Publications. 2003. p. 232. ISBN 1-85743-184-7. ^ "To Implement the United States-Bahrain Free Trade Agreement, and for Other Purposes". White House Archives. Retrieved 23 June 2012. ^ "Qatar, Bahrain to build friendship bridge". Retrieved 23 June 2012. ^ a b c d e f g h i j k l m n "Report of the Bahrain Independent Commission of Inquiry". BICI. ^ "Bahrain mourners call for end to monarchy". The Guardian. London. 18 February 2011. ^ "Day of transformation in Bahrain's 'sacred square'". BBC News. 19 February 2011. ^ "Bangladeshis complain of Bahrain rally 'coercion'". BBC News. 17 March 2011. ^ "Bahrain declares state of emergency after unrest". Reuters. 15 March 2011. ^ "Curfew Follows Deadly Bahrain Crackdown – Curfew Enforced, Several Dead and Hundreds Injured as Security Forces Use Tanks and Helicopters To Quash Protest". Al Jazeera English. 16 March 2011. Archived from the original on 14 April 2011. Retrieved 16 April 2011. ^ Farmer, Ben (18 March 2011). "Bahrain authorities destroy Pearl Roundabout". The Daily Telegraph. London. ^ Chulov, Martin (1 June 2011). "Bahrain sees new clashes as martial law lifted". The Guardian. London. ^ "Thousands rally for reform in Bahrain". Reuters. 11 June 2011. ^ "Heavy police presence blocks Bahrain protests". Al Jazeera. 15 February 2012. Retrieved 17 February 2012. ^ "Bahrain protesters join anti-government march in Manama". BBC. 9 March 2012. 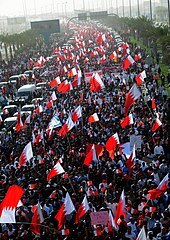 ^ "Mass pro-democracy protest rocks Bahrain". Reuters. 9 March 2012. ^ Law, Bill (6 April 2011). "Police Brutality Turns Bahrain Into 'Island of Fear'. Crossing Continents (via BBC News). Retrieved 15 April 2011. ^ Press release (30 March 2011). "USA Emphatic Support to Saudi Arabia". Zayd Alisa (via Scoop). Retrieved 15 April 2011. ^ Cockburn, Patrick (18 March 2011). "The Footage That Reveals the Brutal Truth About Bahrain's Crackdown – Seven Protest Leaders Arrested as Video Clip Highlights Regime's Ruthless Grip on Power". The Independent. Retrieved 15 April 2011. ^ Wahab, Siraj (18 March 2011). "Bahrain Arrests Key Opposition Leaders" Archived 7 March 2012 at the Wayback Machine. Arab News. Retrieved 15 April 2011. ^ Law, Bill (22 March 2011). "Bahrain Rulers Unleash 'Campaign of Intimidation'". Crossing Continents (via BBC News). Retrieved 15 April 2011. ^ (registration required) "UK – Bahrain Union Suspends General Strike". Financial Times. 22 March 2011. Retrieved 9 April 2011. ^ Chick, Kristen (1 April 2011). "Bahrain's Calculated Campaign of Intimidation – Bahraini Activists and Locals Describe Midnight Arrests, Disappearances, Beatings at Checkpoints, and Denial of Medical Care – All Aimed at Deflating the Country's Pro-Democracy Protest Movement". The Christian Science Monitor. Retrieved 15 April 2011. ^ "Bahrain inquiry confirms rights abuses – Middle East". Al Jazeera English. Archived from the original on 3 October 2012. Retrieved 19 June 2012. ^ "Bahrain protesters join anti-government march in Manama". BBC. 9 March 2012. Retrieved 11 March 2012. ^ "Bahrain delays U.N. investigator, limits rights group visits". Reuters. 1 March 2012. ^ Gregg Carlstrom (23 April 2012). "Bahrain court delays ruling in activists case". Al Jazeera English. Retrieved 14 June 2012. Kechichian, J. A. (2002). "Bahrain". Encyclopædia Iranica. New York: Mazda Pub. This article incorporates public domain material from the United States Department of State website https://www.state.gov/r/pa/ei/bgn/index.htm (U.S. Bilateral Relations Fact Sheets). Mohammed Ghanim Al-Rumaihi (1975). Bahrain: A study on social and political changes since the First World War. University of Kuwait. Khalaf, Abdulhadi (1998). Contentious politics in Bahrain: From ethnic to national and vice versa. Manama is the capital and largest city of Bahrain, with an approximate population of 157,000 people. Long an important trading center in the Persian Gulf, Manama is home to a very diverse population. After periods of Portuguese and Persian control and invasions from the ruling dynasties of Saudi Arabia and Oman, Bahrain established itself as an independent nation during the 19th century period of British hegemony. Gerrha was an ancient city of Eastern Arabia, on the west side of the Persian Gulf. Tylos was the name used by the Greeks to refer to Bahrain, as the centre of pearl trading, when Nearchus came to discover it serving under Alexander the Great. From the 6th to 3rd century BC Bahrain was included in the Persian Empire by the Achaemenids, an Iranian dynasty. The Greek admiral Nearchus is believed to have been the first of Alexander's commanders to visit the island, and he found a verdant land that was part of a wide trading network; he recorded: "That in the island of Tylos, situated in the Persian Gulf, are large plantations of cotton tree, from which are manufactured clothes called sindones, a very different degrees of value, some being costly, others less expensive. The use of these is not confined to India, but extends to Arabia." The Greek historian, Theophrastus, states that much of the islands were covered in these cotton trees and that Tylos was famous for exporting walking canes engraved with emblems that were customarily carried in Babylon. Ares was also worshipped by the country's indigenous and Greek population. The Qarmatians were a syncretic branch of Sevener Ismaili Shia Islam that combined elements of Zoroastrianism. They were centered in al-Hasa, where they established a religious-utopian republic in 899 CE. They are most known for their revolt against the Abbasid Caliphate. Muharraq is Bahrain's third largest city and served as its capital until 1932 when it was replaced by Manama. The population of Muharraq in 2012 was 176,583. Islam is the state religion in Bahrain. Due to an influx of immigrants and guest workers from non-Muslim countries, such as India, the Philippines and Sri Lanka, the overall percentage of Muslims in the country has declined since the late 20th century. Bahrain's 2010 census indicated that 90.2% of the population is Muslim. The last official census to include sectarian identification reported 83% as Shia of the Muslim population. Uqair (Arabic:عقير) is an ancient fort of Islamic origin, located in the Eastern Province, Saudi Arabia. It is alternatively spelled Al-'Uqair, Uqayr, and Ogair, all Latin transliterations of the same Arabic word. It has been linked by some to the ancient city of Gerrha mentioned in Greek and Roman sources. The site was also the location of the conference at which the Uqair Protocol of 1922 was issued, which helped to establish the borders of modern Saudi Arabia. Pre-Islamic Arabia is the Arabian Peninsula prior to Muhammad's preaching of Islam in the early 7th century CE. 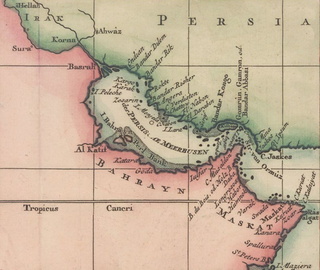 Eastern Arabia was historically known as Al-Bahrain until the 18th century. This region stretched from the south of Basra along the Persian Gulf coast and included the regions of Bahrain, Kuwait, Al-Hasa, Qatif, United Arab Emirates, Qatar, Southern Iraq, and Northern Oman. The entire coastal strip of Eastern Arabia was known as "Bahrain" for ten centuries. Al-Aḥsāʾ, al-Ḥasāʾ, or 'Hadjar' is a traditional oasis historical region in eastern Saudi Arabia whose name is used by the Al-Ahsa Governorate, which makes up much of that country's Eastern Province. The oasis is located about 60 km (37 mi) inland from the coast of the Persian Gulf. Bahrain, officially the Kingdom of Bahrain, is an island country in the Persian Gulf. The sovereign state comprises a small archipelago centered around Bahrain Island, situated between the Qatar peninsula and the north eastern coast of Saudi Arabia, to which it is connected by the 25-kilometre (16 mi) King Fahd Causeway. Bahrain's population is 1,234,571, including 666,172 non-nationals. It is 765.3 square kilometres (295.5 sq mi) in size, making it the third-smallest nation in Asia after the Maldives and Singapore. The Uyunid Emirate, Uyunid Kingdom or Uyunid State, was founded by Abdullah bin Ali Al Uyuni in 1076-1077. The tribe seized the country from the Qarmatians with the military assistance of the Great Seljuq Empire in 1077-1078 AD. The country mainly consisted of the region of Bahrain in the east of the Arabian Peninsula. Bahrain–Iran relations are the bilateral relations between the countries of Bahrain and Iran. Since the 1979 Iranian Revolution, relations between the two countries have been strained over various geopolitical issues such as the interpretations of Islam, aspirations for leadership of the Islamic world, and relations with the United States, Europe and other Western countries. In addition, Iran has been severely critical of Bahrain for hosting the United States Fifth Fleet within the Persian Gulf at the Naval Support Activity Bahrain base.